I am enjoying the burst of happy yellow whenever I go past my tv room (in my last post). I feel a little burst of energy and happiness whenever I catch a glimpse of my yellow gnome and lamp. While my little girl was having a nap today I decided to jump online and see how other people have injected a bit of happy yellow into their spaces. This is what I found. Awesome styling!!!!!!! Check out the cool light fitting. I just love the above image. No....I mean I really LOVE this image!!!! I want my kitchen to look like this. I love how this kitchen looks fun, fresh and bright. 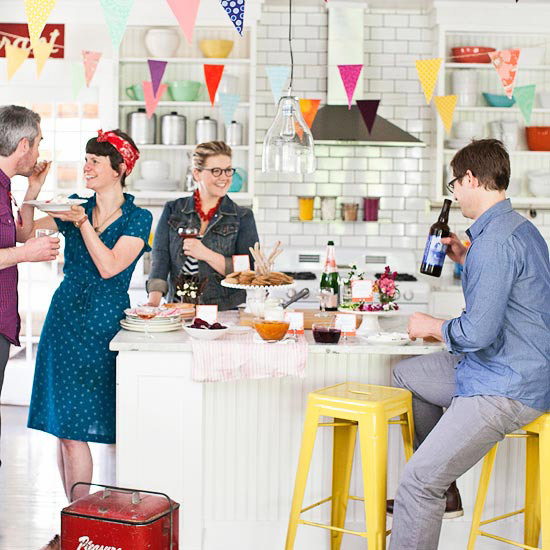 I am also loving the colourful bunting hanging in the kitchen. I wonder if I would be allowed to do this in my kitchen??? I want to go to a party at this house! 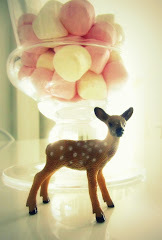 The gorgeous image is from Lolalina's blog. The image was taken as part of a photo shoot for an ice cream party for an Ohio hand made ice cream company (Jeni's Splendid Ice Creams). Cool! This is how I think yellow can look great in a home. Simple. Neutral colours and theme with an awesome pop of happy yellow. I think this works really well. This image comes from zaInteriora - a blog about all sorts of interior designs. I am also digging this image from Urban Kaleidoscope (awesome name for a blog). Kate Challis from Urban Kaleidscope also has a post with an 'ode to yellow'. I agree with Kate - when decorating an interior - yellow looks best when used sparingly - just like in the image above. 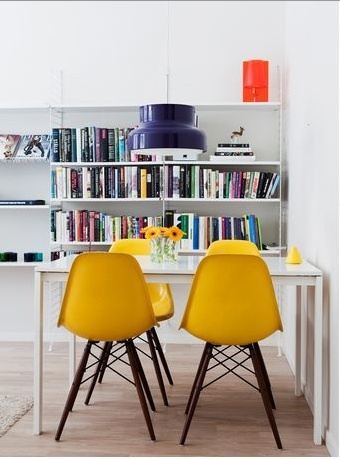 I am also a big fan of these eames chairs! 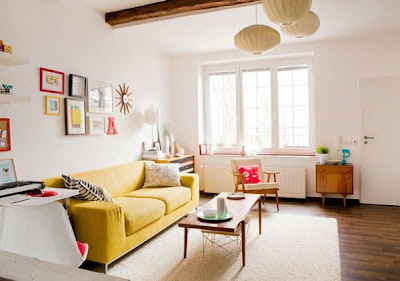 Not sure if I would ever have the courage to purchase a yellow couch but I do like this living room. I think that the yellow couch works because the rest of the living room is pretty neutral. What do you think? Could you do a yellow couch? I also really like the art work collage on the wall. The yellow in the art works ties in well with the couch. This pretty living room image is from Infoteli - a blog about architecture and interior design. 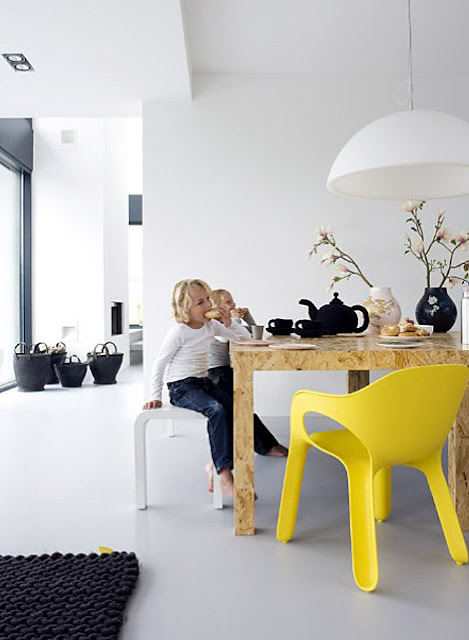 I like this last image because once again there is a lot of white in the room and the beautiful timber dining table contrasts well against the yellow chairs. I am secretly (not so secret now) thinking of purchasing some of these chairs (maybe one or two) for my dining area. The image comes from Home Design - a blog full of interior design ideas.